Making decisions is usually not automatic. Therefore, we often fall into the “pushing through” of a decision based on the majority with a lot of frustrations or we postpone the decision again until the next meeting. What can you do if you want & have to make a decision, knowing that the most important things are shared during the coffee break? Then you need a methodology that actively brings in the coffee break points during decision-making. 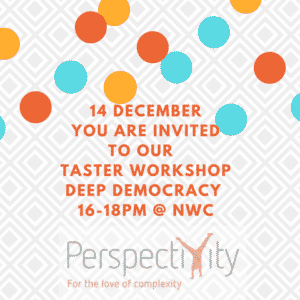 Deep Democracy (Lewis method) is a method of looking at an issue from all angles before making a decision, in which the perspective of the minority is actively integrated. Questions like: “Is there is someone who has a very different idea ‘and’ what do you need to go along with this decision” make sure that information and ideas continue to flow in a group and the decisions are taken wiser. This is an experiential introduction workshop for anyone who wants to achieve a goal with others. Whether you are a member of management, professional, manager, teacher, consultant or student who leads a project. This workshop is free of charge! In this age of increasing complexity absolute blueprints are outdated. We bring a new perspective: we want to use the complexities of contemporary society by making the maximum use of the richness of diversity. We are Perspectivity Enterprise. We design interactive processes to build a humane and sustainable society. ← 10 Year Perspectivity Celebration!! !